I’ve been on and off the fence about the direction that Catwoman has been taking as of late, but in this issue she’s almost solely in the mask, and that’s where I like her. But some lines get crossed, and it’s definitely not the easiest issue to read. In issue 43, Sionis and Hazigawa are well aware of the gangs defecting from their side to the Calabrese side. They decide that one rules all, or things are evenly split. Since they don’t want to share, they need to rule all. And the way to do that is to take down Catwoman. Sadly, the Catwoman that they take down is Eiko Hazigawa, the woman who took up that Catwoman helm in Selina’s wake. She is shot by Sionis after realizing the gravity of the situation. He is unaware that it is his partner’s daughter that he has killed, as Killer Croc drags her (seemingly) dead body off the street. 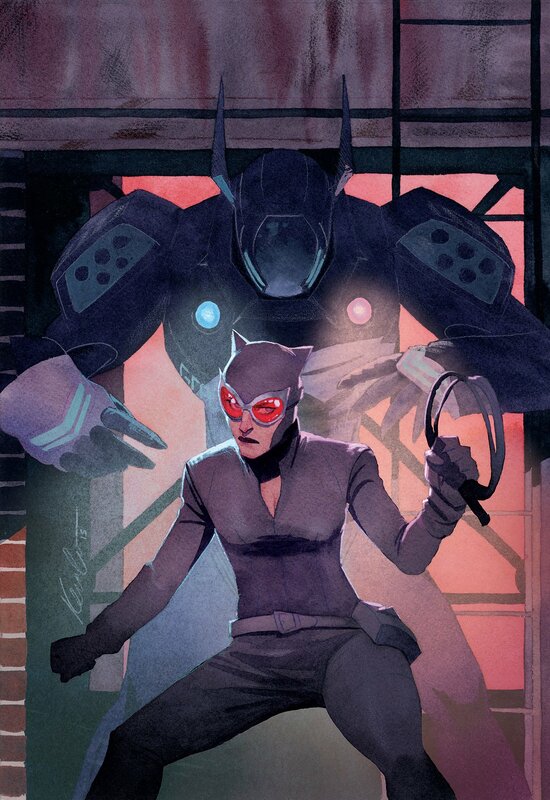 Selina, as Catwoman, also fights in this issue, with the new robotic Batman. After she gets away, she runs into Bruce Wayne, who is now broke (?) and working at a youth center. I like the way he looks; rugged with a beard and flannel. I think it suits him far better than a tuxedo and clean shave. He gives Selina a place to stay, if only for a moment, to get away from the mechanical Batman. Though she is unmasked, he’s aware of her situation. 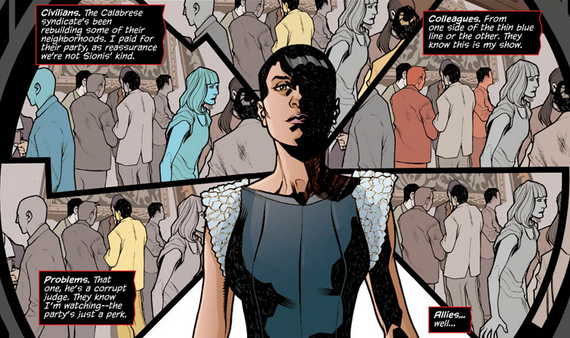 When Selina gets back to her roof (while masked), Antonia confronts her about leading a double life. She has figured it out, thanks to the Penguin, who has asked for Catwoman’s head, as proof of Antonia’s intent to take control of the Calabrese family. 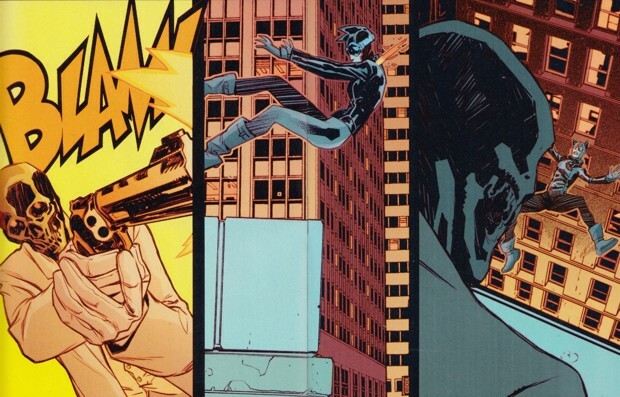 Though she doesn’t kill Selina / Catwoman yet, the issue closes with a close shot of Antonia, whose gun is quite visible. The break-up of panels in this comic are just so amazing. This comic is absolutely gorgeous, Fangirls. The art is phenomenal, and the way the panels are broken up always astounds me. Spoiler (who now works with Eiko) was training in it, in a Black Canary t-shirt, which was a nice reference, and she was also in Batgirl’s annual comic. I think the relationships between these hero and villain women are really interesting, and it’s nice to see them showing up in each other’s comics. I’m glad Selina is wearing the mask more often, I just hope it doesn’t get her killed. It shouldn’t as we saw in the future comic where she escapes death. Hopefully they’re sticking with that storyline.